……meanwhile, out in God's country, a couple of Flatwater refugees congregated to break some clays and gossip about our less fortunate brethren in Nebraska!! Tom's an iron-man----we shot together Saturday morning at Quail Run (east of Parker)--he then shot a round at a course east of Colorado Springs---then another round east of Pueblo---all on Saturday. We met at Kiowa Creek early Sunday morning but the rain discouraged me----his plan was Kiowa Creek then Colorado Clays and finally Great Guns up by Ft. Collins all on sunday----don't know if he got rained out or not, but I admire his stamina. I did have a near Flatwater experience. We got snowed in Sunday night in Cheyenne (60 miles from home). I found out after the fact that Vince (Setters Forever) was snowed in at a hotel about 1/2 mile away. Voss hook us up phone wise and we almost got together for breakfast but Vince was already in the Que on I-80 waiting for it to open. He was one, along with Andy C. and Big Tex that I was anxious to meet at their first Flatwater. 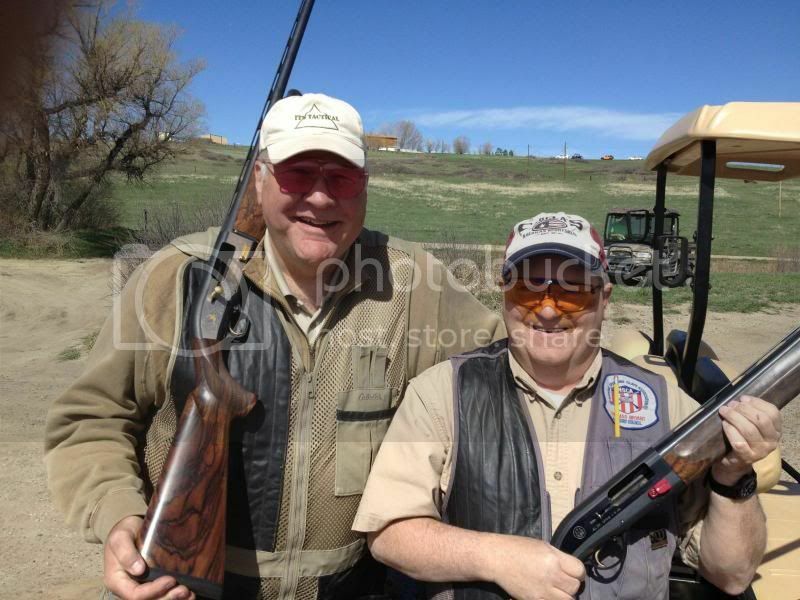 FWIW, Tom's running a Vintage sporting clays shoot over the 4th of July weekend in Saratoga, WY. Probably won't have the 1911's and AR's that Flatwater now has, but will be a first class event if Tom's running it. I'm planning on going---heck I hear that Sundog even attends---will be nice to see Ron again. Sorry to have missed Flatwater this year, at least Bluestem (Brad) was there to uphold the dignity of the KS coalition!! 99.9999999%of robberies don't have the Mission Impossible theme song playing in the background. It's usually circus music. ...the blindness from subjectivity is indistinguishable from the darkness of ignorance. It was great fun shooting with Greg. Super event. Not equal to flatwater, I do concede, but still fun. The snow and 40 mile-per-hour winds combined with rain convinced me that heading home was the smarter thing. Did not shoot on Sunday. Very flatwater ask however, 16 cars in the ditch between Atwood and Sterling Colorado. 3/4 inches of hail on the interstate and 75 mile-per-hour winds. Last edited by Stackbarrel16 on Mon Apr 28, 2014 8:56 pm, edited 2 times in total. Hey BB: Is that a real stick of wood on that shotgun, or is that the Beretta virtual-wood covering? ……no that's a piece of juglans regia that Jim Greenwood built for me……nothing like a fitted stock that costs 3 times what the gun cost!! Looks like it weighs 3x, too. Great photo and good to see Tom again. Dustin was also stranded in Cheyenne and hunkered down at the Air Force base. The last time I drove through Cheyenne it was blowing a steady 50mph and I pulled tumbleweed out of my truck for the next month. A heavy shotgun is less likely to blow away. ……no that's a piece of juglans regia that Jim Greenwood built for me…You should see what I just got thru Mister Greenwood ??? Well, next time see if he can't find a piece with some figure in it for you. Jim knows his way around a stick of wood for sure.